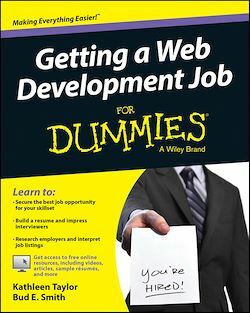 Getting a Web Development Job For Dummies provides a roadmap to one of the "hot jobs" in the booming world of tech. The web development field is large, and it encompasses many actual functions. This book helps you understand the web development career opportunities and determine the path you should take, based on your own personal needs and preferences, to launch your career. You'll learn about various career options, the skills you'll need to become an attractive candidate, how to go about learning the ropes, and proving your abilities to a potential employer or client. With so many possible goals and no one right way to get there, this book cuts through the confusion to put you on the path to a career you want. The web development industry is expected to grow for the foreseeable future, and there is already a shortage of trained workers to fill the jobs. Whether you lean technical or aesthetic, you can find your place in the industry with right skills—both hard and soft—and with the right plan. Getting a Web Development Job For Dummies is your guide to formulating that plan and getting started right. If your pet peeves include malfunctioning forms, flashing banners, and sites that take way too long to load, the web development world needs you. But before you begin your journey, you need a destination and a route in mind. Getting a Web Development Job For Dummies is your roadmap, so you can set out today.